The parish of Weasenham St Peter is situated in the Breckland District of Norfolk. It lies north of Weasenham All Saints, south of Raynham and west of Wellingham. The name Weasenham may derive from the Old English meaning ‘Wissa’s homestead’. Obviously the name St Peter derives from the dedication of the parish church. The parish has a long history and was established by the time of the Norman Conquest. Its population, land ownership and productive resources were detailed in the Domesday Book of 1086 under the name of Weasenham (with no division for St Peter and All Saints). This document reveals that William Warenne owned land in the parish and that Wesenham possessed various livestock including pigs, sheep and cattle. The prehistoric period is well represented in Weasenham St Peter. Although no definite sites have been recorded a large number of flint tools have been recovered. Many of these flint objects could not be assigned to a specific period (e.g. NHER 16937 and 16945) but a number of different tool types have been identified including scrapers (NHER 16938), knives (NHER 17079), flakes (NHER 40793), arrowheads (NHER 17081), pounders (NHER 17080) and ‘agricultural implements’ (NHER 16945). Those items that could be more accurately dated are Neolithic, and many of these come from lands belonging to Kipton Ash Farm (NHER 11252, 11454 and 16923). Additionally, several Neolithic flint axeheads have also been found at Gravelpit Breck (NHER 16924). Evidence of Bronze Age activity in the parish is largely absent. No sites or finds have been attributed to this era, but it is possible that some of the unidentified prehistoric flint tools could date to the Early Bronze Age. The subsequent Iron Age period has a similar paucity of finds. The only artefacts on record comprise pottery sherds (e.g. NHER 3691, 3719 and 32851). Rather more Roman archaeology survives in Wesenham St Peter. A diverse collection of artefacts has been recovered, including pottery sherds (NHER 3677 and 3692), coins (NHER 15099), floor tiles (NHER 3678), iron horseshoes (NHER 3694) and a military strap distributor (NHER 3691). However, the finest objects to have been discovered were all found in one area (NHER 32850) during 2000-02. This haul consisted of thirty coins, a brooch, a finger ring and a bracelet. Despite this evidence it has not been possible to pinpoint any particular areas of Roman occupation or activity. During Saxon times a church dedicate to St Paul (NHER 32993) existed in the parish. The exact site of this Late Saxon/medieval church is unknown but it was listed in 1368 as separate from St Peter's (NHER 3730) and All Saints' churches. Presumably it was demolished at some point in the past. 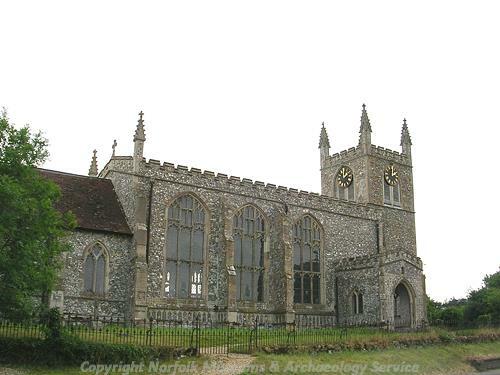 Metal detecting has served to provide the rest of the Saxon archaeology for Weasenham St Peter. This work found a Late Saxon stirrup strap mount (NHER 43976), part of a Late Saxon brooch (NHER 36619) and sherds of Thetford Ware pottery (NHER 3719). The only other Saxon finds were discovered in the 19th century and took the form of a pair of Early Saxon brooches (NHER 3664). The earliest still standing monument in the parish is the medieval church of St Peter (NHER 3730). This church dates to the 13th-15th centuries but was restored in the 19th century. The west tower is in the Early English style but has 19th century parapets. Most of the windows are in the Perpendicular style but the south side of the church features a Decorated style petal-tracery west window. The Saxon church dedicated to St Paul (NHER 32993) was also functioning in this period. Although no other medieval buildings survive into modernity, traces of building material from this era do. The farm office at Manor Farm dates to the 19th century but incorporates a large amount of reused medieval stone (NHER 17339). Additionally, pieces of roof tile (NHER 30983) allude to the former presence of a medieval structure. The village of Weasenham St Peter was not the only settlement in the parish during the medieval era. The village of Kipton (NHER 3674) existed, and was mentioned in the Domesday Book. Sadly, its exact location is uncertain but place name evidence may suggest it was located near to Kipton Ash Farm or Kipton Heath, with the site of a livestock market noted at Kipton Ash. It is possible that this market (NHER 16178) was established in association with this now vanished village. The remainder of the medieval evidence takes the form of small finds recovered by metal detecting and fieldwalking. Items that have been discovered include a forked buckle (NHER 3691), a strap end (NHER 3694), a spoon (NHER 15634), a ewer fragment (NHER 35350) and an assortment of pottery sherds (e.g. NHER 15100 and 16254). Rather unusually, no post medieval buildings of archaeological interest have been recorded. Nor are any sites relating to trade, manufacture or agriculture, other than Kipton market (NHER 16178), which continued to be used having been established in the medieval period. As such, small finds represent the only evidence of post medieval activity in the parish. Artefacts found comprise mundane items like a spur (NHER 3691), a horse harness bell (NHER 3693), a knife (NHER 32850) and a spoon (NHER 3719). More interesting artefact that have been discovered consist of a clothier’s/weaver’s seal (NHER 3691) and a bronze finger ring (36619). The former of these at least gives some hint of the trades operating in Weasenham St Peter during the post medieval period. It is also worth noting that a scatter of post medieval glass and brick fragments (NHER 29989) found in the allotments to the southwest of the church suggests a post medieval building once stood here. The most recent record for Weasenham St Peter relates to a World War Two pillbox/defensive bunker (NHER 17338). This structure stands outside the southwest corner of St Peter's Churchyard. It is built from brick with a concrete roof with a door to the north and two small windows to the south. It is believed that it was constructed for use by the Home Guard during the war. Thomas Sunley (NLA) 17 August 2007.